Rosendahl Letter to Public Works Board Requests Denial of Zipline Appeal - Yo! Venice! Update: the appeal was denied earlier today. The Venice Zipline project will now go before the Coastal Commission. I am writing to respectfully request you deny the appeal and approve the issuance of the Local Coastal Development Permit (CDP) 12-03 in connection with the Venice Zip Line Project. During this economic crisis, all City departments have had to learn to do more with less. Permitting the Venice Zip Line would be a wonderful opportunity for a private-public partnership that could generate some much needed revenue for Los Angeles City Recreation and Parks to maintain Venice Beach. If approved, the Zip Line would be permitted for a three month trial period which will allow the City to assess whether there are traffic, noise or other issues attributed to this project. I have requested the majority of the revenue collected by Recreation and Parks to go directly to Venice Beach for improved maintenance operations at the restrooms and boardwalk. 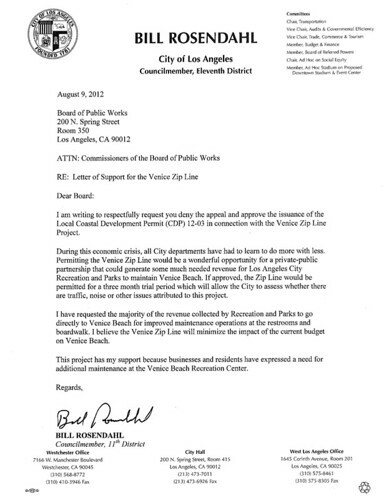 I believe the Venice Zip Line will minimize the impact of the current budget on Venice Beach. This project has my support because businesses and residents have expressed a need for additional maintenance at the Venice Beach Recreation Center.